A 15th century reliquary of St James the Apostle in the cathedral of Pistoia, Italy, which also contains relics of his mother, Maria Salome, as well as St Martin of Tours, and two early local martyrs, priests named Rufinus and Felix. 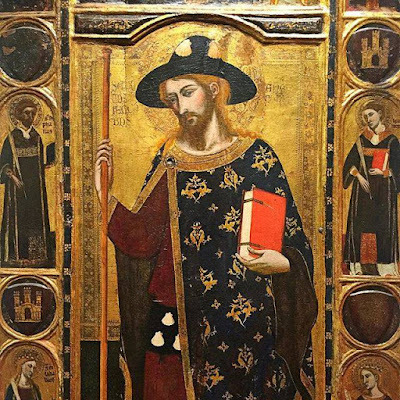 The tradition that St James went to Spain and began the work of evangelizing that country is a fairly late one; it was unknown to writers of the early centuries, and even explicitly denied by St Julian, the archbishop of Toledo and Primate of Spain in the later 7th century. The Golden Legend of Bl. James of Vorgaine devotes very little space to it, saying merely that “he went to Spain, to sow the word of God there. 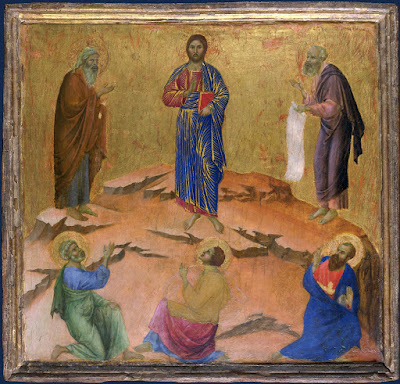 But when he saw that he was making no progress there, and had made only nine disciples, he left two of them there to preach, and taking the other seven with him, returned to Judaea.” These are traditionally known as the “Seven Apostolic Men”, Saints Torquatus, Ctesiphon, Secundus, Indaletius, Caecilius, Hesychius and Euphrasius; the Tridentine Martyrology has an entry for them on May 15th, which states that the Apostles ordained them as bishops and sent them back to Spain, where they preached the Gospel in various places. The Golden Legend goes on to give a lengthy account of St James’ martyrdom, which includes the conversion of a magician named Hermogenes; at the end, a story is told of how his relics were translated to Spain, one which does much to enhance the author’s reputation for excessive credulity. Lest it seem that too much credulity is given here to the hagiographical skeptics, even the pre-Tridentine Roman Breviary shows great reserve about these traditions, giving no space to any part of the legend of St James, not even the very ancient story recorded in Eusebius. All nine of the Matins lessons for the feast are taken from a homily of St John Chrysostom on the day’s Gospel, in which he says much in praise of Salome as one who followed Christ, and was principally concerned with the eternal salvation of her sons. In the Tridentine Breviary, a new set of readings was composed for the second nocturne, which sum up the traditional story as described above. It also notes that James’ death took place around the time of the Jewish Passover, but that his feast day is kept on the day of the translation of his relics to the famous cathedral at Compostela. The church of Rome was always very slow to accept new liturgical texts; one often finds that a Saint who was hugely popular in the Middle Ages had a proper Office elsewhere, but was celebrated in the Roman Use with a Common Office. Such is the case with St James. At Compostela itself, an Office was sung with a completely proper set of antiphons, responsories and hymns, which refer to the tradition of his coming to Spain, the presence of his relics, and his frequent aid to the Spanish kings in liberating the peninsula from the Moors during the Reconquista. One of the best of these antiphons was then received by the Dominicans for the Magnificat at First Vespers of his feast, although they did not take on any of the rest of the propers from Compostela. O lux et decus Hispaniae, sanctissime Jacobe, qui inter Apostolos primatum tenes, primus eorum martyrio laureatus! O singulare praesidium, qui meruisti videre Redemptorem nostrum adhuc mortalem in Deitate transformatum! Exaudi preces servorum tuorum, et intercede pro nostra salute omniumque populorum. A superb motet by the Spanish composer Ambrosio Cotes (1550-1603), with the first words of the antiphon given above. O light and glory of Spain, most holy James, who among the Apostles holdest the primacy, the first of them crowned with martyrdom! Our special defense, who merited to see our Redeemer transformed in the Godhead while yet a mortal! Hear the prayers of thy servants, and intercede for our salvation, and of all peoples! 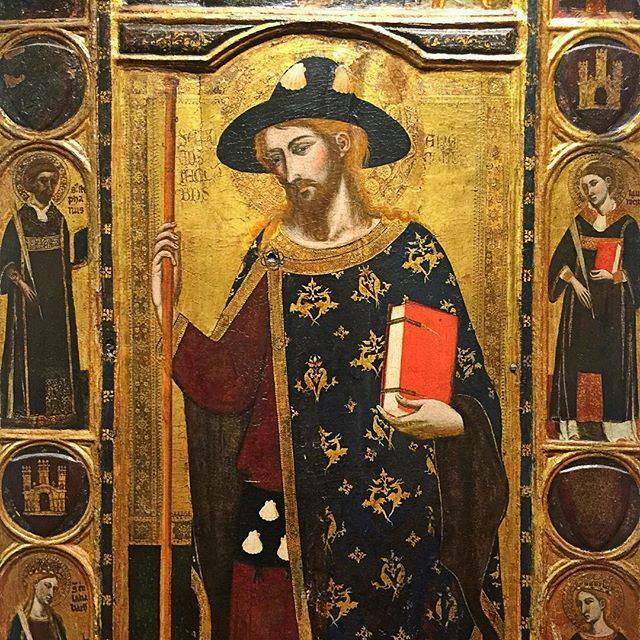 St James the Greater dressed as a pilgrim, by Ferrer et Arnau Bassa, ca. 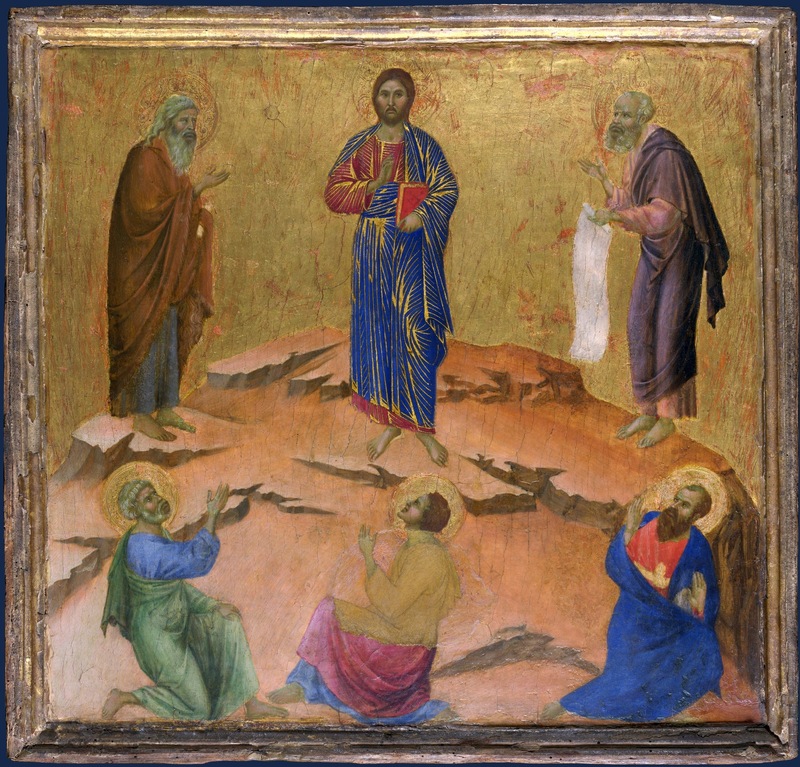 1347; from the Diocesan Museum of Barcelona (Courtesy of Schola Sainte Cécile).